Serving luxury accommodations of Standard, Deluxe & Studio room categories to our national & international guests. Corner Stay – Homestay is located in Race course, a posh locality, in the heart of Coimbatore. 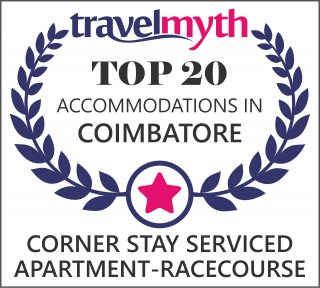 Established and maintained by Mr.Muthumaanickam and family, Corner stay offers fully furnished accommodation with serviced apartments in Coimbatore for your short stay needs. Our serviced apartments are suited ideally for people looking for Guest house accommodation in Coimbatore, and are under the direct care of the promoters, who are ready to provide you with home like care 24/7. Our Service apartment located on Race Course Road, in Coimbatore, offers healthy home cooked food and a warm and cosy ambiance provides you with a home away from home experience to make your trip very memorable. Be it corporate travel, medical tourism, wedding visits or a fun tour to unwind, our competitive tariffs and superior service makes Corner stay a perfect option for your stay. A caretaker is present round the clock to tend to your needs. Health home cooked food is available at a very nominal charge and on a pre-order basis. You may also use the kitchen to cook your own food (Only if whole apartment is booked). The property is located near hospitals like GKNM , Kidney centre , good life clinic, Arya vaidhya Pharmacy , GEM hospital and K.G Hospitals and is ideal for medical tourists visiting these hospitals and looking for serviced apartments in Coimbatore close to these places . You could either book single rooms in which case you have complete privacy within your individual rooms and the common areas like hall , dining and kitchen will be shared with other guests. You could also book the complete house where the whole 2 bhk house is at your disposal ensuring complete privacy. Our Service apartment located on Race Course Road, in Coimbatore, offers healthy home cooked food and a warm and cosy ambiance provides you with a home away from home experience to make your trip very memorable.